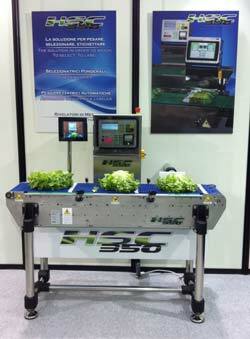 NEMESIS presents the new HSC350 checkweigher Q series with IP67-IP69K environment protection. The checkweigher Q series, optionally combinable with a grading system with up to 9 channels, is designed and realized to work dirty and unpackaged product such as lettuce, cabbage, fennel, broccoli and any kind of fruits and vegetables. Our goal is to give a new option to agro-industrial producers with a full automatic weight control integrated with a grading system at an unrivalled cost ratio. Checkweigher Q series is innovative in design, construction and ease of use: it allows the sorting of products according to their weights in 2 up to 9 channels, with manual or automatic loading.